Home Politics Chavismo Will the real Plan de la Patria please stand up? Will the real Plan de la Patria please stand up? What was originally intended as the electoral platform or program of the late Hugo Chávez for the 2012 election (its original name is Program of the Fatherland) was later put into something called a “Constituent Process”, transforming it into a governing plan for the following six-year term (2013-2019). 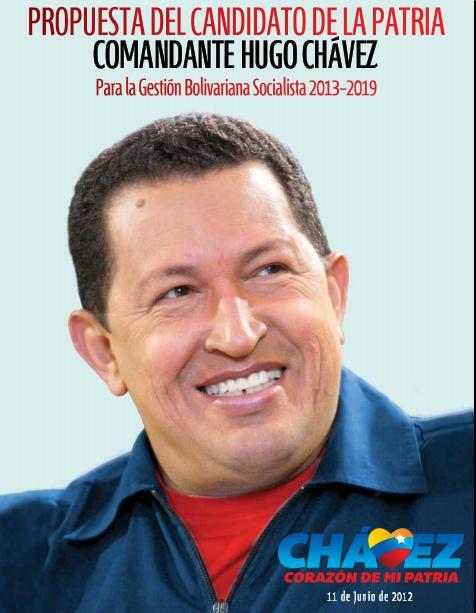 Then, Chavez passed away on March 5th, 2013, and the plan suddenly became something larger – his political will. Nicolás Maduro assumed Chavez’s plan as his own, and months later the Chavista majority in the National Assembly took it even further: passing it as a “Law of the Republic”, which would be mandatory for all citizens. Until they kinda backtracked on that shortly after. Now, there’s an internal controversy inside Chavista circles, as the current Plan de la Patria isn’t like the original version presented in 2012, and its changes are significant, so much so that some radicals within chavismo (aren’t they all?) are not happy. Chavista columnist Toby Valderrama is outraged that the current plan was hijacked by what he calls the “internal right”, regarding the economy and giving the tiniest of roles to the private sector. After Maduro himself chatizised Valderrama publicly, the columnist sort-of apologized. Still, the new Plan de la Patria also includes elements that could heavily restrict free speech and create what can be defined as a “permanent state of Martial Law”. In the end, the Fatherland Plan – whichever version – is slowly overriding that little blue book known as the Constitution.